Birmingham has plenty to offer, from rich civil rights movement and rail travel past to diverse shopping opportunities, Southern cuisine, great outdoors and other world-class cultural and historic attractions. Here’s a 24-hours itinerary to help you explore the “Magic City”. Start your day right with a delicious, traditional Southern breakfast at the Bogue's. 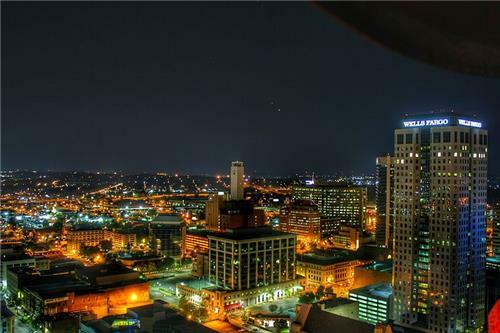 It is located smack dab in the center of Birmingham’s Southside. The restaurant serves up American comfort food. Chow down on American classic, including fries, burgers, eggs, sausages and more. Do save a room for their tasty homemade biscuits. 10:00am- Experience the beauty of flora at Birmingham Botanical Garden! Experience the natural beauty of Birmingham at the Birmingham Botanical Garden. You will be captivated by the charm of the rose gardens, wildflowers, camellias, that thrive in this calm and beautiful setting. The garden also has a teahouse, a Japanese garden, the largest greenhouse in the Southeast, beautiful trails for walking, outdoor sculptures and other spots in this green space. 11:00am- Up-close encounter with animal kingdom at Birmingham Zoo! Next, head off to Birmingham Zoo that features more than 1,000 animals and birds of different species in their natural habitats. In addition to lions, hippos, rhinos, giraffes, monkeys and elephants, the zoo feature several special exhibitions also. See sea lions splash, ride an elephant, feed the giraffe, check out the predator zone, alligator swamp, and much more. The zoo offers plenty of opportunities to see, feed and touch a variety of animals and bird species. 12:00pm- A piece of history at Vulcan Park and Museum! See the magnificent cats-iron statue that stands atop Red Mountain- Vulcan, the Roman god of the forge. It offers a splendid vista of Birmingham’s skyline. This visually captivating structure was built to pay tribute to the early iron industry of Birmingham. It and is surrounded by a museum and a park. The exhibits and displays in the museum chronicle the Birmingham’s rich and unique history. 2:00pm- Fun with science at McWane Science Center! Visit the McWane Science Center where many facets of science are showcased in interactive and fun way. It offers many interactive exhibits depicting the world’s most interesting scientific principles. The center houses an aquarium, dinosaur fossils collection, a playground and an IMAX theatre where you can catch a Hollywood block buster or a science-themed movie. 3:00pm- Glimpse of Birmingham’s past at Birmingham Civil Rights Institute! Next, head off to Birmingham Civil Rights Institute that features the history of Birmingham. The museum chronicles the story of Civil Rights Movement and beyond and also tells how Birmingham has transformed in four decades. The struggles, success and stories of the people who lived through the separation era in Birmingham are remembered at this center. It also has a gallery that features exhibits detailing the story of the Civil Rights era in Birmingham. 4:00pm- Be inspired at Birmingham Museum of Art! Visit the Birmingham Museum of Art that features more than 25,000 works of art. It houses an impressive collection of European, Asian, Pre-Columbian, African, Native American and American art. Other highlights include Baroque paintings, late thirteen century to the 1750s decorative arts, European decorative arts of the 18th century, and Wedgwood collection. Shop for antiques at What's On 2nd! It features vintage and antique items, ranging from dolls, classic posters and video games to cameras to 1940s and 50s household items and wartime postcards to quirky knick-knacks and memorabilia. Swing by the Avondale Brewing Company and enjoy a few beers. It has a great selection of hand-crafted brews. In 1910s, Miss Fancy the Elephant was a local landmark and now it is their mascot. This spot is rich in history and there are beers named for each important moment from the background of the brewery. Hear some good old stories, while sipping on brews. Stop by the Good People Brewing Company that has an extensive selection of beers. It is one of the local’s favorite breweries in Birmingham. Kick back and guzzle a few cold beers. 10:00pm- Get out and party hard! Head off to The Nick that features the best local and big-name bands that play everything from emo, alternative rock to blues, pop, metal, and everything in between. Grab some cold beer, enjoy the diverse range of live musical acts and have a whale of time! Swing by the Zydeco that offers more than 13 beers on tap and cocktails, pool tables, video games, music and an upstairs patio. Grab a few drinks, play a game of pool or video game, enjoy live music, ranging from hip-hop, rock to blues, reggae and Cajun music.